Decoration in a wedding is something that counts a lot and therefore, intensive decoration should be done. If you are planning to have a wedding and you are wondering what you can use to make the event colorful, you should not worry since Petcarl-Décor.co.ke is there to give a solution to this. No matter the budget for your wedding, we have the right decorative products to suit your wedding theme. The wedding parasols can be fantastic items to use while taking the wedding photos, shelter your bridesmaids from the sun or maybe to decorate your wedding tent. 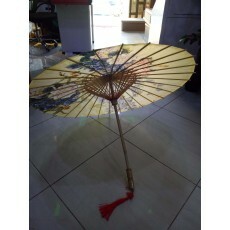 The wedding parasol is handmade and beautifully hand painted with bamboo frame, handle and lock mechanism. The floral parasol can also be used in other special occasions such as birthdays, parties and festivals. Decorating a wedding reception, bridal shower or garden party is easy with paper parasols. Visit Petcarl-Décor to buy cheap and quality wedding parasols which come in different colors and styles.